Whiplash associated disorders or injuries often affect the head and neck and are caused by a sudden exaggerated thrust of the head in any type of direction, we primarily see whiplash associated with rear end car accidents but more and more we see cases related to contact sports such as Rugby league/union. These exaggerated, abnormal forces are applied to the anatomy of the neck with muscles, ligaments, nerves, bones (vertebra, skull, jaw), intervertebral discs, blood vessels, and even the eyes all likely to be stressed toward their physiological limit. More serious injuries can occur when the head reaches its end range of physiological movement such as compression fractures and disc herniation injury on hyper-flexion of the head and neck and on hyper-extension we can see injuries such as avulsion (pulling) fractures, spinous process fractures and even possible vascular and neural structures being overstretched and damaged. On both hyper flexion and extension we will likely see some damage to either the anterior (front) vertebral ligaments or the posterior (back) vertebral ligaments. 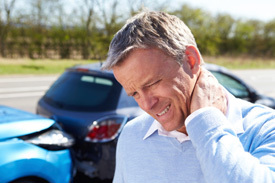 It is important to seek care after a whiplash injury, firstly to rule out any red flags such as fracture, spinal cord injury or head trauma and secondly to begin the recovery. Whiplash injuries require early intervention with a number of studies (references below) stating that early diagnosis and early active interventions of mobilisation, soft tissue therapy and exercise showing better reductions in perceived pain, range of motion and sick leave when compared to a standard intervention of initial rest, recommended use of a soft collar, and gradual self-mobilisation. Our job here at Synergy Healthcare is to lengthen the tight/hypertonic muscles, help reduce inflammation and begin to retrain and strengthen some of the muscles that were injured during the whiplash, to help our patients maximise their recovery. We do this through, soft tissue therapy of the muscles and ligaments of the neck, manipulation and mobilisation of restricted cervical joints and initiation and guidance through a specific personalised exercise rehabilitation program based on your specific musculoskeletal presentation. As always we can provide much more information on this topic so don’t hesitate to contact us on 02 9522 2125 or via email clinic@synergyhealth.com.au and see how we can assist you here at Synergy Healthcare. Rosenfeld, M., Seferiadis, A., Carlsson, J., & Gunnarsson, R. (2003). Active intervention in patients with whiplash-associated disorders improves long-term prognosis: a randomized controlled clinical trial. Spine, 28(22), 2491-2498. Rosenfeld, M., Gunnarsson, R., & Borenstein, P. (2000). Early intervention in whiplash-associated disorders: a comparison of two treatment protocols.Spine, 25(14), 1782-1787.